In January of 1871, William Brickell set off from New York with Ephraim Sturtevant and two hired carpenters to the banks of the Miami River. He traveled with enough timber and building materials to construct two homes. Due to a variety of circumstances, the group ended up only building one home on the south bank of the Miami River. On December 9, 1871, Mary Brickell and her six children joined William to live in the home that William and the others were able to complete. At the time the Brickells moved the family to the Miami River, it consisted of four girls and two boys. William Jr. was the older boy at six years of age. Charles was three years old at the time. From the time of they arrived through the year of Miami’s incorporation, the Brickell family slowly expanded their real estate holdings around the area of their home. When William Brickell Sr. passed away in 1908, the two Brickell boys had families of their own and made their living helping to manage the family’s real estate empire. To capitalize on the housing shortage in Miami during the 1910s, William and Charles used part of their land holdings to build apartments. This article is the first of two describing the stories of the apartments built by the brothers. This one will detail the story of the building constructed by Charles Brickell. By the middle of the 1910s, Miami was growing so fast that there wasn’t enough housing for those who wanted to spend their winters in the Magic City. The housing crisis provided opportunity for those who owned property. The Brickell family had plenty of real estate. Charles chose to use a waterfront lot along the eastern portion of Twentieth Street to build an apartment building. Twentieth Street would later be renamed Eighth Street as part of the Chaille Plan implemented in 1920. The Brickell Apartments were completed in the latter part of 1916 and opened in January of 1917. An article in the Miami Herald on January 19, 1917, referred to the apartments as “A New Structural Delight”. It resided on the south side of Twentieth (Eighth), Street along Biscayne Bay. Brickell Key was just a small spoil island at the time. The building was designed by George L. Pfeiffer and constructed by the St. John Construction Company. The location of the Brickell Apartments was situated on part of eighteen acres of bay bottom fill. Prior to the shore line being extended with fill, it originally terminated on the western edge of today’s Brickell Bay Drive. The building occupied a frontage of 108 feet on Biscayne Bay and a depth of 207 feet from the bay. The newly created land provided a desirable location for residents of the apartments. The building was described as having traces of Moorish architecture. The top floor was designed to accentuate the views from all directions. At the time the apartments were completed, it was said that one could see for miles in any direction from the roof. As one entered the main entrance of the apartment building, he or she would be ushered into a large reception hall, or rotunda, that was both cozy and distinguished. The building offered an electric elevator, which was rare for Miami in 1917. There were twenty four apartments in the building and they were spacious. The floor plans consisted of one to four bedroom configurations. Each apartment had a private bath, hot water, electric lights and its own balcony. The design of the building was to accentuate air flow and provide good light exposure. The building was made of reinforced concrete and was considered semi-fireproof. The building materials were in contrast to the wood frame buildings that comprised many of the older buildings in Miami during the second decade of the twentieth century. 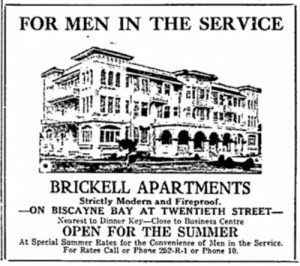 At the conclusion of World War I in 1918, Charles Brickell placed ads in the Miami Herald offering apartments for returning veterans. Many soldiers trained in Miami prior to being deployed overseas, and they had fond memories of Miami. There was a big growth in population following the end of the war. Unlike many apartments and hotels in Miami, the Brickell Apartments remained opened during the summer. While institutions in downtown Miami catered to winter visitors, the Brickells wanted to also appeal to the year round resident. The design of the building to accentuate sea breezes was a big incentive for Miami residents prior to air conditioning. On August 21, 1920, it was announced that Charles sold the Brickell Apartments to The Pennsylvania Company for $160,000. Apparently, the offer to sell was too good for him to pass. The apartments were run by Charles and his wife for three and a half years prior to the sale of building and property. At the time of the sale, the Miami Herald referred to the Brickell Apartments as “one of the most elaborate and modern buildings in Miami”. The Pennsylvania Company began investing in Florida real estate shortly before the acquisition of the Brickell Apartments. The new owners chose to keep the original name for the apartments. The acquisition of the apartment building was the first step in a plan to provide a much larger investment in the property. The new owners intended to extend the land further into the bay to build a hotel to the east of the apartment building. There is no evidence that this plan was ever implemented. Later photos of the area only showed a single apartment building on the property. After selling his apartment building, Charles and his family lived in a mansion located at 823 Brickell Avenue. His home was located two blocks west of the Brickell Apartments. However, just four years following the sale of his apartment building, Charles Brickell passed away in his home on August 4, 1924. He had just returned home from a trip to Pennsylvania a few days prior to his death. His family remained in Pennsylvania and Charles was expected to join them a few days later. Charles was visiting with his sister Maude the night before his death. Maude stated that he was in perfect health when he left for home that night. He was found unresponsive by his sister Belle the next morning. He died at the age of 58 from a heart attack. Charles was survived by his wife, Fannie, and his son James. Mary Brickell’s second oldest son passed away just two and a half years after she died in 1922. 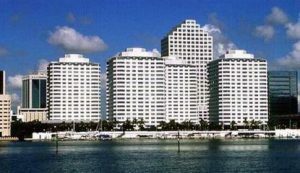 In May of 1956, it was announced that Charles Creighton and a partner had purchased the Brickell Apartments for $350,000. At the time of the sale, the lot spanned 217 feet along Brickell Bay Drive and 400 feet deep. Charles Creighton was the owner and operator of a restaurant in Fort Lauderdale called Creighton’s Restaurant. The Miami Herald article went on to explain that Creighton and his partner intended to knock down the Brickell Apartments and erect a two story, twenty four thousand square feet restaurant along the bay. The plan for the restaurant would include seating capacity for four hundred people in the dining room and one hundred more in the lounge. Creighton was searching for a location in Miami ten years prior to purchasing the Brickell Apartments in 1956. He and his partner bought more than four hundred feet of undeveloped land just south of the Brickell Apartments before making a bid to buy the property and building. Prior to the sale, the Claughton family was the owner of the Brickell Apartments and land. The Claughtons owned a lot of property in the area, including Claughton Island (later referred to as Brickell Key on Claughton Island), and the Urmey Hotel in downtown Miami. At the time of the announcement of the sale of the apartment building, the Brickell Apartments were considered one of the oldest apartment houses in Miami. It was only forty years old in 1956, but there were many residents that had fond memories of their time living in the building. The sale of the property required residents to make quick accommodations for a new home. Those being evicted were interviewed by the Miami Herald to capture memories of their time in the Brickell Apartments. Most of the families who moved into the apartments in the early years were near retirement and wanted a warm weather retreat. Their children were grown, and the Brickell Apartments represented a tranquil place to enjoy their golden years. The apartments were referred to as a “place to rock”. However, the expression referred to residents favorite past time of relaxing on rocking chairs and enjoying the pleasant sea breeze. While the building never had air conditioning, residents observed that the high ceilings and sea breezes provided a comfortable ventilation during the summer. The place was so quiet that residents reflected on the tranquil sounds of the wind through the palm and buttonwood trees, and the music of mockingbirds off into the distance. Long-time residents remember the days prior to electric refrigerators when ice was delivered daily. In most cases, the men were retired and the women enjoyed shopping downtown to pass the time. The building featured an elevator that was manned by two full time employees. The elevator operators were considered family to the residents who lived in the building for many years. Many residents would return year after year from cold weather locations such as Cleveland or Chicago. The first couple to move into the building was Mr. and Mrs. Ernest Roger of Boston. They moved in as newlyweds in 1917 and returned every year for thirty nine years. Mrs. Roger passed away just prior to the sale of the apartment building in 1956. Early residents remembered Fannie Brickell, the widow of Charles Brickell. Residents referred to her as the woman who lived in the big white house up the street. In the early years, Fannie was the manager of the building and she took that role very seriously. She was considered a friend and a great hostess to the residents of the building. Fannie would greet guests as they arrived, send flowers to their rooms, and provide trays when they were sick. Those who remembered Fannie said that she was responsible for making the Brickell Apartments “the house with a heart”. By January of 1961, Charles Creighton had not done anything with the land he bought five years earlier. He was hoping to get a mortgage to finance his restaurant, but he was unable to secure the necessary loan. Creighton entered into an agreement with Ralph Bush, a Norfolk Builder, who owned the adjoining eight acres south of the apartment building. Bush planned to build a 560 unit apartment complex on this land. Creighton provided the option for Bush to purchase his land to allow for an expansion of the project. From the time that the last resident of the Brickell Apartments moved out in 1956 to 1961, the building remained vacant and frequently occupied by vagrants. There were several occasions when the fire department was called to extinguish fires started by trespassers. Finally, the city required that the apartment building, along with several other structures on the property, be condemned and knocked down. Five years after the purchase by Creighton, the Brickell Apartments were finally razed in 1961. Just two months earlier, the city also required the demolition of Charles Brickell’s former mansion on the corner of SE 8th Street and Brickell Avenue. Similar to the Brickell Apartments, Charles former home was dilapidated and occupied by vagrants. Dr. Fuad Hanna, a local doctor and former proprietor of the Hanna Apartments on Brickell Avenue, led the charge to eliminate the public safety hazard that was once the Charles and Fannie Brickell home. Many local residents referred to both the mansion and apartment building as haunted. From Brickell Avenue to the bay, SE Eighth Street had become a derelict part of the Brickell neighborhood by the early 1960s. 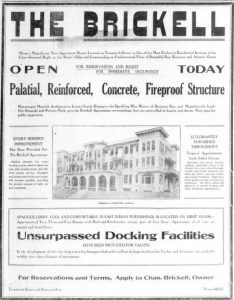 The Brickell Mansion at 823 Brickell Avenue was so dilapidated that demolition by neglect preceded the actual demolition by a number of years. 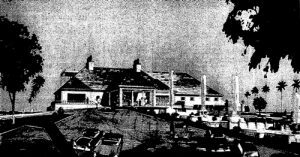 The Charles Brickell home was razed in November of 1960. The former location of the Brickell Apartments would sit vacant for several more years until a new development would take its place. Construction of the Four Ambassadors was completed in the latter part of 1967. The complex featured a hotel, meeting rooms, retail and residences when it opened in January of 1968. The hotel was originally a Sheraton. The complex still stands today and consists of four buildings that sit between Biscayne Bay and Brickell Bay Drive. While the Four Ambassadors featured a hotel at its opening, it consists of 744 condominium units and retail at the ground level as of the writing of this article. The Four Ambassador’s construction site was a featured location in the Frank Sinatra movie “Tony Rome” filmed in 1967. The scene featured Frank Sinatra’s character, private detective Tony Rome, interviewing the general contractor for the Four Ambassadors project while it was under construction. The movie also filmed a number of scenes at Vizcaya. Shortly after the Sheraton opened in 1968, it was host to the “Southern Christian Leadership Conference” from February 18th to the 23rd, in 1968. The conference included one hundred fifty ministers from fifteen different cities. Dr. Martin Luther King Jr. presided over the closing ceremonies of the conference. In addition to closing the conference, Dr. King also led seminars on non-violence. While Dr. King was in Miami, his closest advisors tried talking him out of attending an appearance in Memphis, Tennessee in April. Those closest to him felt it was too dangerous to visit Memphis. Less than six weeks later, on April 4, 1968, Dr. King was assassinated in the very city that concerned his advisors. While the Brickell name is a firmly established brand in Miami, it is easy to forget the family members behind the name. Charles Brickell arrived in the Miami area at the age of three. His arrival preceded incorporation of the city by almost twenty five years. Charles died at the relatively young age of fifty eight. At the time of his death in 1924, Miami had only been incorporated for twenty eight years. By contrast, at the time of the writing of this story, ninety two years have passed since his death. Charles life shows us that a person’s contributions can easily become a distant memory as time passes and buildings are razed. The Brickell Apartments were one of Charles Brickell’s contributions. While it may no longer be standing, we still can appreciate the beauty of the building through old pictures. Hopefully, this story can provide some insights about the people and events that made the Brickell Apartments a significant structure in the Southside (Brickell), neighborhood during the first half of the twentieth century. Part Two of this article series will tell the story of William Brickell’s apartment building. 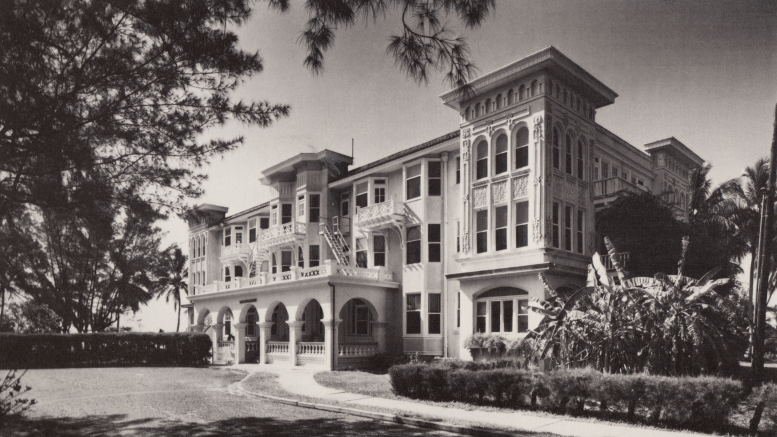 William constructed the Bulmer Apartments in 1921 and moved his family from a Brickell mansion to the apartment building shortly after it was completed. The Bulmer Apartments remained standing until 1977. Cover: Featured: Brickell Apartments in 1956. Courtesy of Miami-Dade Public Library System as part of the Gleason Waite Romer collection. Figure 2: Ad for opening of Brickell Apartments. Courtesy of the Miami Herald. Figure 3: Ad for Service Men in 1918. Courtesy of the Miami Herald. Figure 4: Creighton’s Restaurant Rendition for Brickell. Courtesy of the Miami Herald. 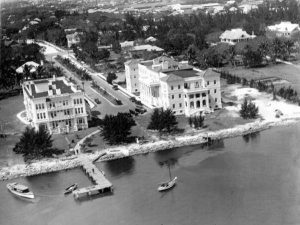 Figure 5: Brickell & Bulmer Apartments in 1930s. Courtesy of Florida Memory. 9 Comments on "The Brickell Apartments"
From whom did the Brickell family purchase their land holdings in the 1870’s. We never hear about the earliest land owners and how they came to hold title. GReaat story Casey. Amazing what Miami has become in the last hundred years. HOLD ON TO YOUER HATS Folks> The Ridemay get better each year. Another excellent and true to the facts article. Good job. As a youngster, my friends and I that lived in the “Brickell Neighborhood” played along the bay from the mouth of the Miami River all the way to Viscaya. This was in the mid 1950’s. The Brickell homestead on SE 8th St and the Brickell apartments were vacant and filled with refuse from vagrants. The upper floors were flush with pigeon nests and droppings. Windows had been broken and the buildings vandalized. I attended Miss Harris School for kindergarten located further South on Brickell Avenue. There was no Bayshore Drive between SE 8th street and SE 13th street. I learned to swim at the Ocean Ranch Motel. All of the properties extended from Brickell avenue down to the bay. I had an idyllic childhood in the Brickell neighborhood. Sadly, this unique area exists only in my memory, old photographs and article such as this. I lived in Miami from 1978 until Andrew hit in ’92. I attended the U from ’82- ’84. I love reading the articles on my adopted city. I just pray that the US takes action to clean up the planet before my beloved South Florida is lost to the rising sea. I came to Miami from Argentina in 1979, I could not enjoy the wonderful first half of the century Brickell years, however I had the opportunity, to enjoy the prior skyscraper Brickell age. I had been living in several Brickell Buildings since 79 until the 90’s, when we moved to KB. To read about the Brickell Av. history is to revive my young happy years with nostalgy. Thank you for sharing such an interesting facts about Charles Brickell and his family. I would love to see Miami in 100 years. It is changed so fast!